Sussman Shank has successfully represented lenders, investors, trustees of securitized trusts, and loan servicers in over two hundred lawsuits filed in Washington and Oregon federal (both District and bankruptcy) and state courts as well as Idaho state court. If a matter is appealed, we routinely obtain successful outcomes for our clients at the state and federal appellate level. We have an excellent understanding of the mortgage industry, including the servicing and sub-servicing of standard and reverse mortgages, lender/servicer pooling and servicing agreements, securitized trusts, and the state-specific processes involved in both nonjudicial and judicial foreclosures. 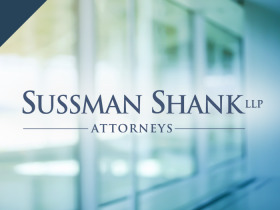 Sussman Shank has significant experience defending wrongful foreclosure, RESPA, FDCPA, FCRA, TILA, HOA lien priority claims, and CPA claims against lender/servicer clients, and we have an outstanding track record of getting such claims against our clients dismissed prior to trial. We also defend contempt claims and adversary proceedings against lender/servicer clients in bankruptcy court. We represented a loan servicer client against a suit filed in Washington Superior Court alleging conversion of funds, as well as violations of various Washington statutes. We prevailed on cross-motions for summary judgment, which resulted in plaintiff's claims against the client being dismissed, with prejudice. We defended a loan servicer client against a wrongful foreclosure claim brought by a borrower in Washington Superior Court. The borrower alleged servicer client mishandled and/or misapplied insurance proceeds from the fire at the subject property. The plaintiff's claims against client were dismissed via client's motion for summary judgment. We defended claims brought by borrower against our lender/investor client in the United States District Court for the District of Oregon, alleging violation of the Oregon Trust Deed Act and seeking to void the trustee's sale. The borrower's claims were dismissed via our client's motion for summary judgment. We defended a lender client and the client's agent against breach of contract and declaratory relief claims filed in Oregon Circuit Court. We obtained dismissal of borrower's claims against our clients via a motion for summary judgment. Our clients were also awarded their costs and attorney fees. We represented a loan servicer client in an action filed by a speculative purchaser/investor in Washington Superior Court. The investor was seeking to nullify our client's secured interest in property due to an alleged acceleration of underlying debt. We successfully obtained dismissal of the investor's claim via summary judgment. We successfully obtained dismissal of a borrower's breach of contract, promissory estoppel, and RESPA claims filed against our servicer client in the United States District Court for the District of Oregon. We successfully obtained summary judgment for our lender and loan servicer clients facing a borrower's claims for violations the Consumer Protection Act and Deed of Trust Act. The summary judgment ruling was later affirmed by the Washington Court of Appeals. We represented our loan servicer client facing a borrower's claims for RICO, fraud, and conspiracy in the United States District Court for the Western District of Washington and successfully obtained summary judgment on our client's behalf. We obtained a defense verdict on behalf of our servicer client on a borrower's claims for breach of contract and breach of good faith and fair dealing after a four-day jury trial in the United States District Court for the Western District of Washington. We successfully resolved show cause motions for violation of bankruptcy stay for our servicer clients.